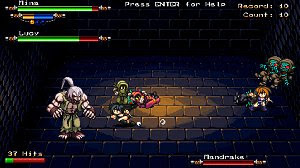 Super Vampire Ninja Zero prototype is a fighting game where the player takes control of Mina, a martial arts expert that has some demon/undead butts to kick! # Normal Mode, where you must defeat a finite sequence of enemies. # Time Attack, where you must survive enemy waves for 5 minutes. # Coop Survival, where you team up with an AI controlled character. The game ends when you or your partner bites the dust. # Practice, where non aggressive enemies will spawn endlessly.